A Chef Was Ignored by a Car Company Because of His Clothes ... What He Did Next Baffled the People on Social Media! We were once told that we should never Judge anyone by the way they look. But what happened to one of the most famous car company in our time was very unforgettable because of this incident that they've been involved with. The man you see in the picture is Reinhard Celis , and he wanted to buy a car for himself, that's why he went to the Branch of Isuzu here in Bacolod. But he was very disappointed after what he experienced inside the showroom of the said company's branch. He narrated everything that happened to him at the showroom on the Photo that he posted on his Facebook account. He said that he was asking about how much the Isuzu DMAX truck that first caught his eyes, but no one is actually giving him the attention that he needed. He was only wearing a plain Blue shirt and Shorts with Unbranded slippers as a getup, which made him look like he has no money to buy a Brand New Car. He even asked the receptionist about the store, but she just smiled at him and answered with words full of nonsense to make him wait for more than 5 minutes. He asked the security guard why they don't entertain supposedly their customer, but he just smiled at him. Chef Jun Celis got ignored by Isuzu Bacolod so he just purchased his sport truck from their competitor. Photo Credit: Reinhard Celis’s Facebook Page. 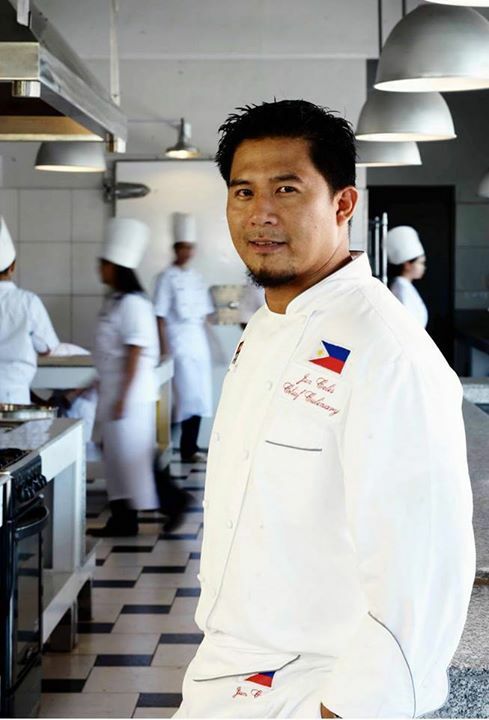 Reinhard is also known as Chef Jun Celis, Yes he is a chef, but not just any chef, he even owns his own restaurant that he named Virgelio's Grill Chain of Restaurants. But I've not been done yet! He's also a culinary consultant for many hotels and restaurants inside and out of the country, and I almost forgot that he is a Director of a culinary school. Knowing how respective he is because of what he have achieved in his life and career, He managed to go to their showroom only wearing these clothes. But unfortunately for them, they've lost a buyer that day because of their attitudes. Chef Jun was very disappointed because of what happened, that's why when he got home, he immediately called his bank and ordered a Mitsubishi Strada and had it delivered on his house after 2 hours. Kudos to Chef Jun because of how he handled the situation and leaves the premises of the showroom without making any scene. Chef Celis is now a proud owner of a Mistsubishi Strada. 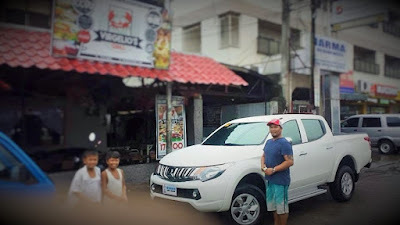 Thanks to the indifferent staff at Isuzu Bacolod, Mitsubishi was able to close a sale. The chef left a reminder to people that they should never judge the book by its cover. Because you might lose something big just like what happened to the showroom of Isuzu in Bacolod. 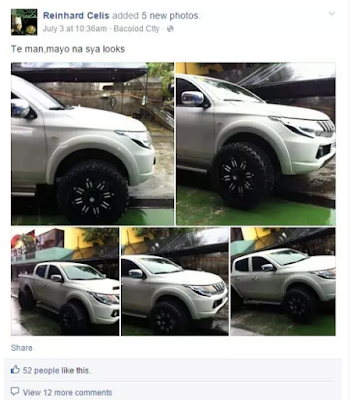 And to the management of that Isuzu, Bacolod branch shame on you! Kakahiya kayo! una sa lahat mayron syang ipagmamayabang. tsaka pangalawa,nainsulto sya tungaw! with all the achievements enumerated above, his posts tell otherwise......."Reinhard is also known as Chef Jun Celis, Yes he is a chef, but not just any chef , he even owns his own restaurant that he named Virgelio's Grill Chain of Restaurants. But I'm not done yet ! He's also a culinary consultant for many hotels and restaurants inside and out of the country, and I almost forgot that he is a Director of a culinary school." Hindi ako galit but i do have something to say. He wasn't bragging or anything, in fact he was just trying to give each one of us a lesson. The problem is people depend on negatives, not positives. Why not just look on the positive side? And why grammar? Even Americans say grammars never matter. Wala naman sigurong naging mayaman dahil sa napakaganda ng grammar niya right? It was all about hard work. It's not fair to judge without hearing or knowing the facts. Let the other side tell their story. Sino ba editor ng blogsite na ito? Mali mali ang grammar ng mga articles eh kakayamot basahin. Please proof-read naman! Sus ginoo! You cannot climb the ladder of success dressed in the costume of failure. And to all people belonging to the service industry>Don't judge a book by it's cover. If I'm gonna buy a car in a showroom, I will definitely dress up to be at least be presentable. What exactly is the costume of failure? Sa pilipinas kasi pag pangit ka failure na agad. Does that count? Both Isuzu and Mitsubishi dealerships in Bacolod are both owned by one person. And this is news, because?